Thinking about taking the plunge with the new Internet Explorer? IE8 has only been out a short time but has already received widespread publicity. The company claims it is "faster, easier and safer," so let's take a look at what's new in this browser release and see if it lives up to the hype. Tab Groups can help you manage a large group of open tabs, by grouping them according to content. When you open one tab from another tab, the new tab appears next to the originating tab and is color coded. A simple right-click will close a tab, or the entire group. Once you get used to tabbed browsing, you'll find it much nicer than opening multiple browser windows when you want to view more than one site at a time. There's also a smarter address bar. If you want to find a previous site, you simply start typing. IE8 searches through all your sources and highlights them in blue. The address bar also highlights the domain name portion of the URL in block, so there's less chance you'll end up at the wrong site. Because some sites are not yet compatible with IE8, you can click the Compatibility View toolbar button to view the site as it would appear with in IE7. This will correct display problems, such as misaligned text and images. You can maintain a list of sites that should be displayed in Compatibility View, so you don't have to click the button each time you visit. I like the time-saving Accelerators in Internet Explorer 8. Here's how they work: Highlight some text on a web page, then click the blue Accelerator icon. You'll get a popup that lets you feed the highlighted text directly into another tool, such as a dictionary, translator, or map. You can also feed the text into a blog, an email message, or search at Google, Amazon or eBay. The results appear in a floating window right on the page. 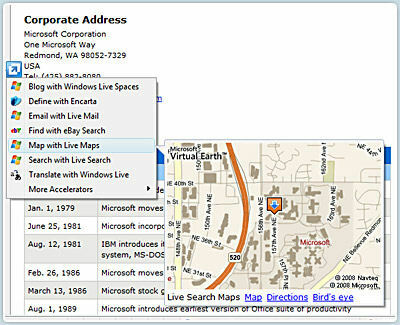 For example, you can highlight an address on the page you're viewing, then select the "Map with Live Maps" accelerator to view an interactive map without ever leaving the page. InPrivate, located on the toolbar, lets you browse incognito. IE will not keep a history of any sites you view using InPrivate mode, and will wipe the cache and cookies when you're done, effectively leaving no trace of your visit. Learn more about the pros, cons and limitations of private browsing in my companion article Private Browsing. When you use the optional SmartScreen Filter, a screen pops up with a warning when you visit a site that may contain malware or a phishing attack. It will also notify you if you attempt to download software that may not be safe. The Cross Site Scripting Filter enables IE8 to detect malicious code running on rogue or compromised websites. This feature helps to protect you from attacks which can steal account information, identity theft, and other hazards. Data Execution Prevention is an IE8 security feature that can block viruses and other security threats from running on your machine. So how does the new Explorer stack up against Firefox 3? There are certainly plenty of geeks out there, like the guys at PC Mag, with time on their hands to literally find out. Most of them downloaded both browsers, and IE8 was generally the winner, although not by much. Half a second or less doesn't really merit awards, although IE's downloading of Apple's home page twice as fast as Firefox warrants some attention. The browser wars often resemble a see-saw. IE8 has matched some of Firefox's popular features, and has upped the ante with some new ones. They've also renewed focus on speed and security. So that brings up an interesting point. The reasons most commonly cited for ditching Internet Explorer are slower speed and poor security. Microsoft seems to have the edge for now in features and speed. And if they can demonstrate that they've nailed down the security issues (at least as well as the Mozilla folks) then the motivation for switching to an alternative browser becomes vanishingly small. But you can bet that the collective of programmers that develop Firefox will not be resting. It will be interesting to see if the Firefox market share continues to grow, or if it has peaked. Most recent comments on "Internet Explorer 8"
I tried IE8 and it really didn't offer much for me over FireFox 3.0.9. Then I updated to FF 3.0.10, but it refused to operate. Since Mozilla/FF website does not offer option to go back to version 9 now that they have 10, I went to another site that offers any version back to FF 2.0 and reinstalled 3.0.9 after first uninstalling 10. I think I'm going to leave well enough alone. Have disabled auto-update for FF in my browser "options" area. Here's another Snickers for you, Bob. I installed MS/Explorer Version 8 recently and found that recent URLs, favorites and history are displaying in the URL address box pulldown. How do I turn this feature OFF? I installed IE8 some many weeks ago, but it lasts about 1 to 3 days before the entire top section is 'splattered' with a portion of an image that was on the desktop when it was brought up, it later comes up black. Nothing can be read though the sections still respond to the mouse: point or point/click. Once 'smeared', it doesn't clear. Even reboot to an empty desktop retains the mostly black area. Reinstall, annoyingly complex, long & requiring a reboot renders it clean for another day or three..
Come on M.S., when are you going to fix this? Marion, I'd like to know how to turn it off, too. I've tried many things and nothing worked. I hated it when I first downlaoded it. Too many changes for a dummy! I'm getting used to it and I'm sure it will grow on me. BJGrey said, "I am still on IE6 'cuz I hate having to relearn MS's programs as they change, not often for the better." I downloaded IE8 and it worked fine for a while... then I started getting "blue screens" telling me something about win 32.sys? I don't have time to play games with it so I dumped it. I use FireFox 3.5 and Chrome which is very fast but somewhat limited. I guess IE8 will probably be bug free in a couple of years? 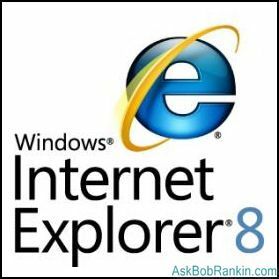 I am unable to install IE8 (will download but installation will not complete even after using the so-called FixIt tool) and after reading the comments I am glad I did not do it. I will stay with FF and I do like Chrome. I have twice tried to install IE 8 on my computer both times my computer went crazy error messages, freezing and directing me to AV360 security program. What's up with that anyway? It seems like more and more web sites are using sleeper programs that wake up when you download the original website's program. I'm really frustrated with this kind of "watch our program sneek up on you" mentality. Any comments on this? I have installed IE* three times in the past 6 weeks and I have a "state-of-the-art system as of 09/11/08 so there should not be any problems. Every time '8" worked fine ONCE then the next time I tried to enter the program nothing happened PERIOD. Using the install/delete feature of windows I have deleted "8", my system has automatically reverted to IE7 without any negative results. I will not attempt to install "8" untill I am sure that my system can handle it or, conversely untill "8" is compatable with my system. Since I upgraded to IE8, I get an error message when I trying opening a PDF. It advises me I have to have Reader version 8 or 9. Problem is, 9 is the version I have! For what ever reason I have never had any of the problems outlined above with IE8 or any prior version. FF and IE8 are installed and working on my three computers with no problems choosing which to run at any given time. I like FF for general browsing; however, I cannot use it with my banking or any other time I need to print a receipt or other document to file. A long time ago Adobe had a program called Active Share that came bundled with Adobe Photo 4.0. This program is no longer offered or supported but I can print to file using it with IE8. Using it with FF to print to file produces a document that seems to be in a Middle Eastern language I cannot read or in computer code. (that would make me sad), or do i uninstall IE8? (not so sad, but will that mean no IE at all?) Okay, I know it shows: I don't know the first thing about any of this, and I just hope someone will jump in hear and give me some advice. Thanx!!! I had IE8 on both my Dell XP desktop and Dell Inspiron laptop. I had all sorts of problems, like this or that does not work with IE8 and to go here or there to fix the problem etc. I had printing problems and slowness problems also and went back to IE7 and plan to stay with 7 till the problems with 8 are worked out. I have auto updates set to tell me I have updates to make sure 8 doesn't sneek back on my computers. There's more reader feedback... See all 55 comments for this article.